Ready to pick in July and August - the fruits are juicy and very sweet and delicious cooked or in mixed fruit salads. 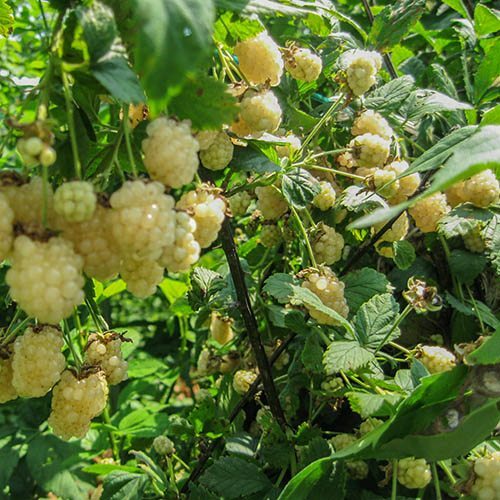 Here's a chance to grow something unique with this brand new variety of blackberry with stunning, almost translucent creamy white berries. Polar Berry grows strongly with an upright habit meaning it needs minimal support and is easy to manage in the garden. Grow it in the border against fence or trellis or give it a sunny spot on the patio in a large pot supported by an obelisk. Ready to pick in July and August - the fruits are juicy and very sweet and delicious cooked or in mixed fruit salads. With just a few thorns they're easy to pick and because of the colour they are much less attactive to foraging birds. Delivered as well established plant in 9cm pots.